This handy shopping list pad is ideal for keeping track of what you really need on your next shopping trip. The magnetic strip on the back also means it can be kept on the fridge, so you can easily and quickly jot down any shopping items or little thoughts as they spring to mind. 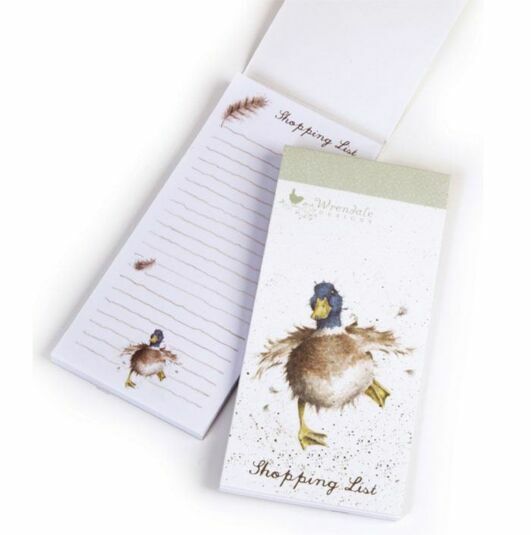 The cover of the pad is printed on textured FSC board and has the words “Shopping List” printed across the bottom in a handwritten script with the Wrendale Designs logo in the top corner. The cover also features a duck with hiswidespread wings and splayed legs, as if he has just landed. The image is painted in soft fawn, yellow and blue, in the trademark watercolour style of Wrendale designer Hannah Dale. There are 49 pages to the pad each of which is roughly lined and features illustrations of feathers and a further image of the duck at the bottom of each page. This pad would make a welcome gift for a busy mother, father, or anyone who runs the house! This delightful range is inspired by the unique animal characters seen in the British countryside, farmyard and home. They are designed and printed in England using low environmental impact materials. The design is taken from an original artwork by Hannah Dale of Wrendale Designs. Each image is delicately painted with soft brushwork, subtle colours and paint spatters which are the trademarks of her style. Hannah is an ex-stockbroker turned farmer’s wife who, inspired by her rural married life, embraced her artistic roots and began painting the animals in the landscape around her.